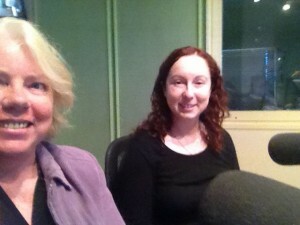 Janis Hanley & Helen Stubbs on Gold Coast ABC Radio. Had a great session with Matt Webber on Gold Coast ABC FM Radio, Saturday morning. Helen Stubbs and I trotted down to the radio station at Mermaid Beach to – well really just to chat with Matt about GCAnth – how it came about and how writers can submit stories. Matt is a fiction writer himself, so he knows the value that a Gold Coast Anthology brings to local writers … and to be paid $100 for accepted stories is a real bonus. So, you’ve started writing your Gold Coast Anthology story and you’re stuck! It happens to me, too. What do you do? Just keep it in the back of your mind while everything in your life is going on around you. Apply everything you see and hear to it to see if things fit. Further inspiration can come from other fiction and real life. Another thing I do is make a mind map of crazy possibilities. You can write anything that comes to mind down. You won’t use most of it, but you might find something good. You could look through some more of our photos. Another one might add inspiration. I love to talk to friends about my stories or ask them to read them, though I have usually finished it before I hand it over to read. Sometimes friends come up with great suggestions and see the story from an angle that I’ve missed. 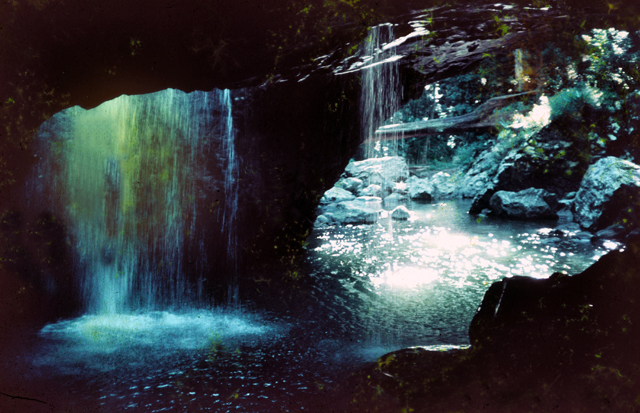 I’m writing this blog with a photo of the Natural Arch, or Natural Bridge attached. I love this place, it’s my favourite easy bush walk, just 50 minutes drive south west of Nerang. If you haven’t been you should go! Really. I’ve been so many times. At daytime, at night time to see the glow worms. I’ve swum in the cave. There were eels, but they didn’t bite me. Swimming under the waterfall is kind of painful, but still fun! I’ve never jumped down the hole. You can’t right now as there’s a big pointy log poking up from the water. You probably shouldn’t ever…but I’d still love to jump, even if it means getting impaled. Maybe, one day. One night I walked down there I am a snake and a crayfish. The crayfish was on the track trying to fight us. Super cute. Good luck with your story writing! Writing and bush walking … two adventures with many winding paths to choose from. Select an image and write us a story. Make sure you check out our submission guidelines. Looking forward to reading your Gold Coast tale. Submissions close 31st August 2013. I’m a new writer, help! Read as much as you can in the way of contemporary Australian short stories in the same genre as you are writing. Complete several drafts and revisions of your story. Ask fellow writers or editors to review and advise on your story. If you have time, put your story away for a week or two and then read it and see if anything needs changing. Explore your local writing groups and join a critique group. Queensland Writers Centre is a great place to start. What is the Gold Coast Anthology? Gold Coast Anthology is a cross genre collection of stories inspired by a selection of images of the Gold Coast, Australia. We invite submissions from authors with a connection to the Gold Coast Australia, from all genres, to assist us to create a collection of stories inspired an image from the set on this website. Please see the submission guidelines if you are considering submitting a story to the anthology. 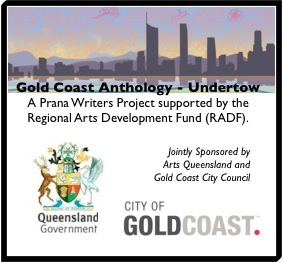 The anthology itself is being organised by Prana Writers, a Gold Coast Writers Group. Funding assistance for the project is provided by a Regional Arts Development Fund (RADF) grant sponsored by arts Queensland and Gold Coast City Council. Images are provided by the Gold Coast City Council’s Local Studies Library collection, ‘Picture Gold Coast’. What’s the go with the photos? The twist with this anthology is that the story needs to link to a photo from under the ‘Photo’ menu on this site. Almost a hundred photos have been selected from Picture Gold Coast, covering a range of places and themes. All photos have been cleared for use in the anthology. All you have to do is select a photo and use that image in some way in your story – It might be the place where the story starts, perhaps its the whole location for the story, or an image in your character’s dreams. It might just be an emotion or situation that the photo evokes for you. The idea of the photos is to inspire a story, and connect it in some way with the beautiful Gold Coast. Great news this week. We got approval for the grant we applied for from the Regional Arts Development Fund (RADF). The ‘we’ in this are the Prana Writers, a Gold Coast writers group that first came together in 2009 as a result of a Gold Coast City Council Writing Competition ‘Write that Book’. Read ‘About Prana Writers’ for more information about who we are and what we do.